The Gloster Javelin was an "all-weather" interceptor aircraft that served with Britain's Royal Air Force in the late 1950s and most of the 1960s. It was a T-tailed delta-wing aircraft designed for night /inclement weather operations and was the last aircraft to bear the Gloster name. The Javelin began with a 1947 Air Ministry requirement for a high-performance night fighter that led to orders for prototypes under specification F.44/46 of two of the competing designs, the Gloster GA.5 and the de Havilland DH.110 which was also under consideration for the Royal Navy. When it appeared that the Gloster design would be ready sooner and would be simpler and cheaper to build, the de Havilland submission was rejected; though the company was to continue development of the DH.110 as a private venture that eventually resulted in the naval Sea Vixen. The Gloster design had a distinctive appearance, its broad delta wings surmounted by a large finned T-tail. The F.44/46 specification subsequently became F.4/48 related to the "Operational Requirement" OR.227. Picture - Gloster Javelin, probably a flight test aircraft, at Farnborough. The GA.5 first flew on 26 November 1951 flown by test pilot Bill Waterton (two months after the prototype DH 110 took to the air), with protracted flight testing taking place until 1956, when the first 14 production machines were delivered, designated F(AW) Mk 1. Development and improvements continued, leading to small production runs of different models of the aircraft throughout the years. By the end of 1956, the Javelin was up to a FAW 7 variant, which was the first to actually meet the specifications of the original Air Ministry requirement, and which was to become the definitive version of the aircraft (most of which were later altered to the FAW 9 standard). Indeed, the Javelin was evolving so quickly that deliveries of the FAW 8 began before FAW.7 production had ended. As a result, the final 80 FAW.7 aircraft went straight from the factory into storage, eventually flying after being remanufactured as FAW.9s. A total of 427 were produced in all variants, plus seven prototypes. Picture - Javelin FAW 7s of No. 64 Squadron RAF in 1959. The Javelin entered service with the RAF in 1956 with 46 Squadron based at RAF Odiham, England and at its peak (in the years 1959 to 1962), equipped 14 squadrons. After 1962, numbers dropped rapidly and, by 1964, only four squadrons were flying the type. The closest that the RAF's Javelins came to combat was during the Malaysian Confrontation with Indonesia from September 1963 until August 1966. Javelins of 60 Squadron, later joined by 64 Squadron operated out of RAF Tengah, Singapore flying combat patrols over the jungles of Malaysia. In 1964, an Indonesian Air Force C-130 Hercules crashed while trying to evade interception by a Javelin FAW.9 of 60 Squadron. During June 1967, following the disbandment of 64 Squadron, 60 Squadron were deployed to Kai Tak, Hong Kong because of unrest in the colony during China's Cultural Revolution. Javelins were also deployed to Zambia during the early stages of Rhodesia's UDI, to protect Zambia from any action by the Rhodesian Air Force. 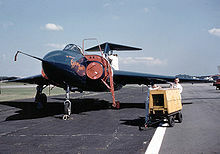 The last of the type was withdrawn from service in 1968 with the disbandment of 60 Squadron at RAF Tengah at the end of April 1968. One aircraft remained flying with the Aeroplane and Armament Experimental Establishment at Boscombe Down until 24 January 1975. A total of 435 airframes were built by Gloster and Armstrong-Whitworth; both companies at that time were part of the Hawker Siddeley group. Several were converted to different marks (sometimes repeatedly). FAW .1 Initial version with Armstrong Siddeley Sapphire Sa.6 engines with 8,000 lbf (35.6 kN thrust) each, British AI.17 radar, four 30 mm ADEN cannon in wings; 40 produced, and the seven prototypes were later fitted to this standard. FAW 2 Replaced the AI.17 radar with U.S.-made Westinghouse AN/APQ-43 radar (known as the AI-22); 30 produced. T 3 Dual-control trainer version with no radar, bulged canopy for improved instructor visibility. All-moving tailplane, lengthened fuselage to compensate for altered centre of gravity, adding additional internal fuel. Retained four cannon; 22 production aircraft and one prototype. FAW 4 Similar to FAW 2, but with the original AI.17 radar of the FAW.1, and with the addition of vortex generators on wings for improved stall characteristics, as well as an all-moving tailplane. 50 produced. FAW 5 Based on FAW 4, with revised wing structure incorporating additional fuel tanks, provision for missile pylons (never actually fitted); 64 produced. FAW 6 Combined FAW 2's American radar with the revised wing of the FAW.5. 33 produced. FAW.7 Introduced new Sa.7 engines with 11,000 lbf (48.9 kN) thrust each, powered rudder, extended rear fuselage. Armed with two 30 mm ADEN plus four Firestreak air-to-air missiles. FAW.7s equipping two squadrons were armed with four ADEN cannon only. ; 142 produced. FAW 8 Upgraded Sa.7R engines with reheat, raising thrust to 12,300 lbf (54.7 kN) thrust above 20,000 ft (6,100 m); at lower altitudes, the limitation of the fuel pump caused a loss of cold thrust..New "drooped" wing leading edge and auto-stabilizer for better handling. FAW.9 A total of 118 FAW 7s refitted with the revised wing and engines of the Mk 8., 44 of these were fitted with refuelling probes as FAW.9F/R. FAW 9R R standing for "Range". A total of 40 of the 44 FAW.9F/R were refitted to carry under-wing fuel tanks. Several variants were proposed and investigated but not produced, including reconnaissance versions, a fighter bomber version with underwing panniers for bombs, and a supersonic variant with area-ruled fuselage, thinner wings, and a new tail. The "thin wing Javelin" would have been capable of about Mach 1.6 and with a higher ceiling than contemporary US designs. Initial work started with fitting a thinner section wing to a Javelin fuselage but as the project developed the changes became so great that it would effectively have been a different aircraft albeit having an outward resemblance to the Javelin. The final incarnation of the thin wing Javelin just before cancellation was a large aircraft carrying two Red Dean all aspect missiles as a possible contender for Operational Requirement F.155. Javelin FAW9 XH768 as XH707 at Cerbaiola. Javelin FAW1 XA564 at the National Cold War exhibition at the Royal Air Force Museum, Cosford, England. Javelin FAW4 XA634 at RAF Leeming, England in No. 228 Operational Conversion Unit RAF markings coded L.
Javelin FAW5 XA699 in No. 5 Squadron RAF markings at the Midland Air Museum, Coventry, England. Javelin FAW9 XH767 in No. 23 Squadron RAF markings at the Yorkshire Air Museum, Elvington, England. Javelin FAW9R XH892 at the Norfolk and Suffolk Aviation Museum Flixton, Suffolk, England. Javelin FAW9 XH903 in No. 33 Squadron RAF markings coded G at Staverton, England on loan from the RAF Museum. Javelin FAW8 XH992 in No. 85 Squadron RAF markings coded P at the Newark Air Museum, Newark, England. British Aircraft Directory Retrieved: 22 October 2007. Winchester, Jim. "Gloster Javelin." Military Aircraft of the Cold War (The Aviation Factfile). Rochester, Kent, UK: The Grange plc., 2006. ISBN 1-84013-929-7. 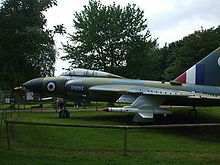 Wixley, Kenneth E. "Gloster Javelin: a production history, Part 1". Aircraft Illustrated, August 1984, Vol 17. No 8, pp. 370-372. ISSN 0002-2675. 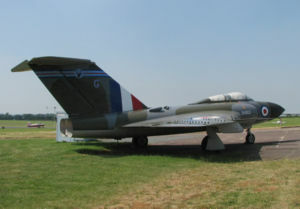 Wixley, Kenneth E. "Gloster Javelin: a production history, Part 2". Aircraft Illustrated, September 1984, Vol. 17, No 9, pp. 420-422. ISSN 0002-2675.